If "memoirabilia" were a word, it would perfectly describe O the Clear Moment. 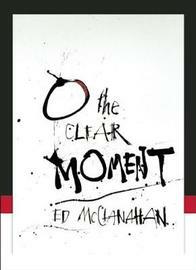 In this enormously appealing "implied autobiography," Ed McClanahan has assembled a gathering of stories that are both quirky and cutting, all told in the inimitable voice of one of his generation's best Southern chroniclers of American life. McClanahan launches his tale in 1950, the year he turned 17 and had his "Personal Best Great Moment" -- one that involved Lucky Strikes, a Tony Curtis forelock, a pretty girl named Bernice, and several raw eggs. From there, McClanahan is off and running, describing characters from his eventful life with affectionate and precise detail. Like "escapees from the cover of the Saturday Evening Post," McClanahan and his stories come alive as American souvenirs, enchanting readers with his signature prose.